It’s time for the color challenge over at Splitcoast today. I really love this color combo…SU! Soft Suede, Calypso Coral and Pool Party. And for dessert today…make it a valentine. Although these aren’t traditional colors for a valentine…I like it! My card base is a standard 5.5″ x 4.25″ size in SU! Soft Suede. Next, I’ve used a template and all three colors of ink to sponge a background. Then a die cut doily in Calypso Coral followed by a die cut border in Pool Party. The heart image is from Verve. It’s been stamped in Pool Party and then die cut with the coordinating Verve die. I inked the edge to give it a little more definition. The sentiment, again from Verve has been stamped in Soft Suede and I added a little trio of hearts in the Calypso Coral. Then a few scattered rhinestones in different sizes for a little bling and done! It’s the Technique Lover’s Challenge over at Splitcoast today. Judy wants our cards to focus on die cuts. So the only stamp I used was for the sentiment. My card starts with an A2 card base in SU! Early Espresso. Next comes a piece of designer paper that’s been distressed and inked. Now for the die cuts…first two sets of clouds cut in white, then two trees cut with a couple of different designer papers. Then lots of little hearts in three different colors. The largest clouds are popped up on dimensionals and then the smaller ones glued on top. Then I shaded the clouds with a Copic marker. Have a great week dear stampers! I took a standard A2 card base and used my craft knife and cutting mat to remove about 1″ of paper from the right border of the front of the card. Then I cut a piece of designer paper, slightly larger and adhered it to the inside of the card. 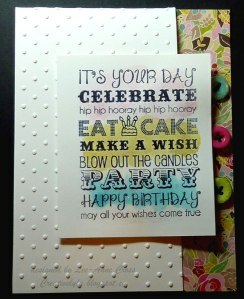 The front of the card was dry embossed with the dots folder. Next I cut a rectangle, again in white card stock and stamped it with the Taylored Expressions Graphic Greetings Birthday image. Then I swiped three different colors of Distress stain across it. It’s been popped up on dimensionals. And, although you can’t really see it, there’s Rock Candy Distress Stickles on the rectangle to add some bling…subtle but it’s there. Added some black thread to the three little buttons and then glued them onto the designer paper with Ranger Glossy Accents. Quick and easy card! Pulling out some of my older stamps to give them some love today. Also used a new stamp I recently purchased too! And went back in time to the emerging color technique. My card base is a standard A2 (4.25″ x 5.5″”) size. Next I inked a piece of plain white card stock with Picked Raspberry and Peacock Feathers Distress Inks. 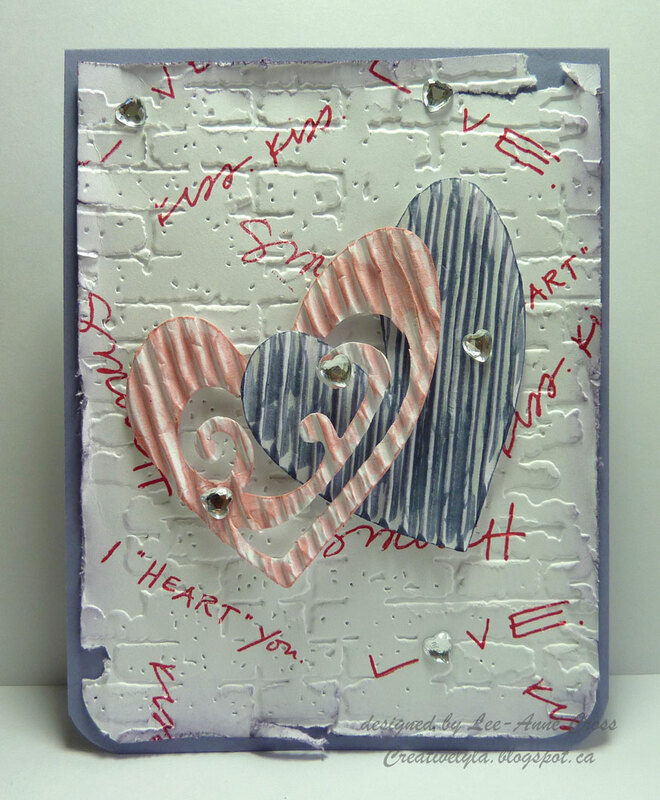 Then I stamped the large floral/script stamp in embossing ink and heat embossed it with clear embossing powder. Next I sponged lots of Chipped Sapphire Distress over the entire piece thus deepening the background and bringing the colors to life. Hence the name…emerging color. The dotted rectangle that peeking out from behind the larger floral image has been made with a dot image stamp in Picked Raspberry Distress Ink. Then using the direct-to-paper technique I added some smudges of both the colors used in the main panel and inked the edges. The smallest rectangle is a piece of SU! 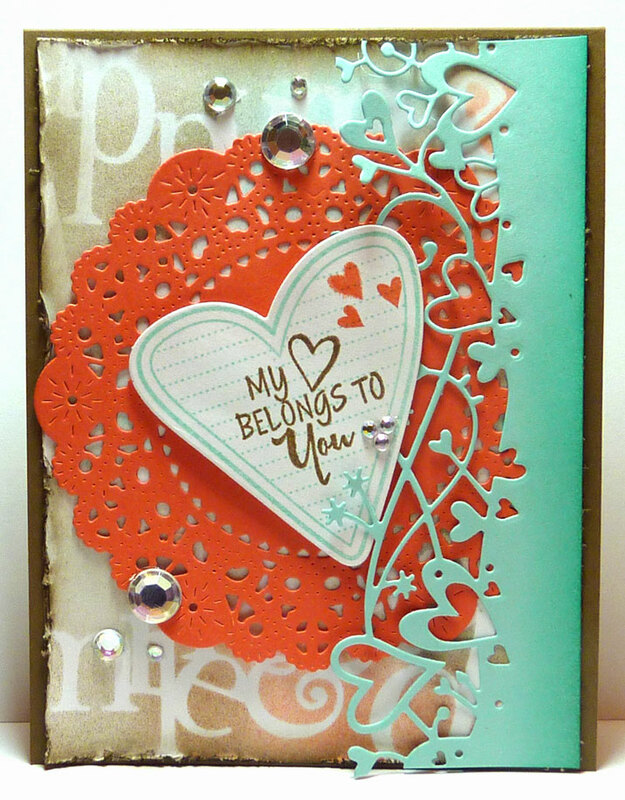 Tempting Turquoise that’s been simply stamped with the Sweet ‘n Sassy floral image and again, inked edges. Then I sponged some Picked Raspberry ink on some white card stock. Next, I inked my craft sheet with the same color and spritzed it with water, then pulled the paper through the it to add the deeper splashes of color. It was then die cut and stamped with the sentiment. Final touches…a few scattered rhinestones. Note: the rhinestones are all the same color but for some reason the top ones look more red??? I have no idea why…one of those great mysteries of the universe right? LOL! 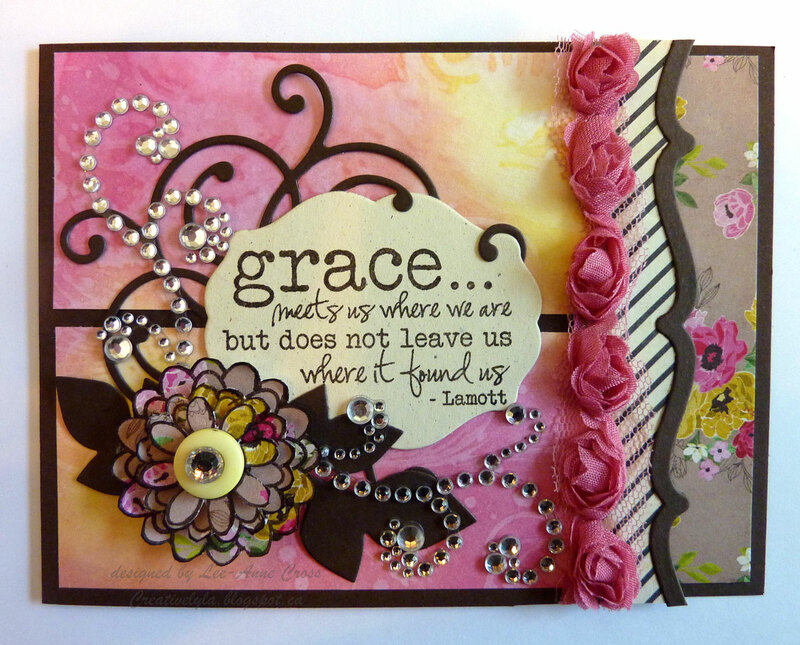 This card is headed off to Martha in Texas, our focus of the Teapotter’s Challenge at Splitcoast this week. 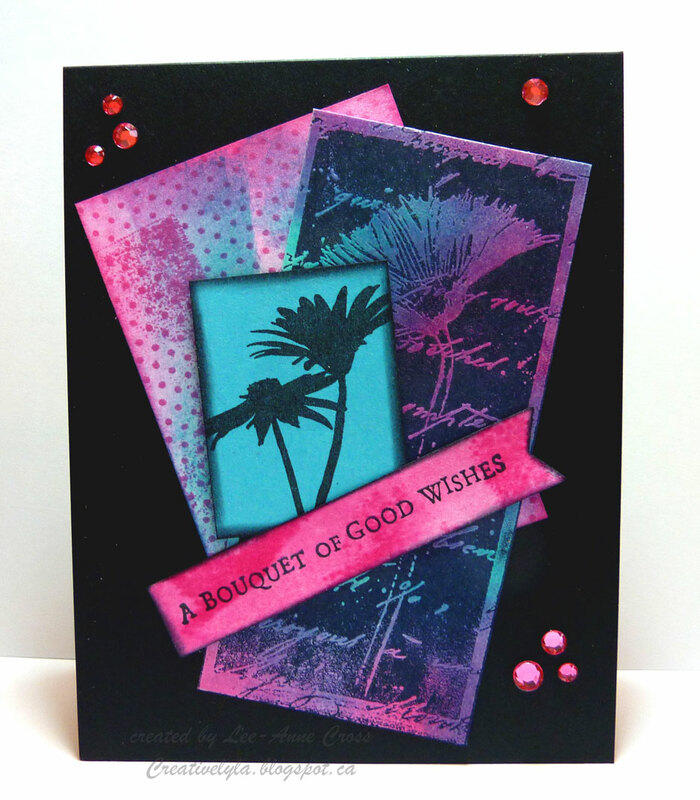 It’s time for another CAS Challenge at Splitcoast Stampers…a color challenge. Our colors to work with are SU! Ruby Red, Kiwi Kiss, Bermuda Bay and Chocolate Chip (or any other inks in red, lime green, turquoise-green, chocolate brown). When I’m making a CAS card sometimes I tend to make a little more detailed card and sometimes I just really love to do pure plain and simple. This doesn’t get a whole lot more plain or simple! My card base is a standard A2 (4.25″ X 5.5″). It starts with stamping the text image in SU! Kiwi Kiss about 2/3 of the way across the card. 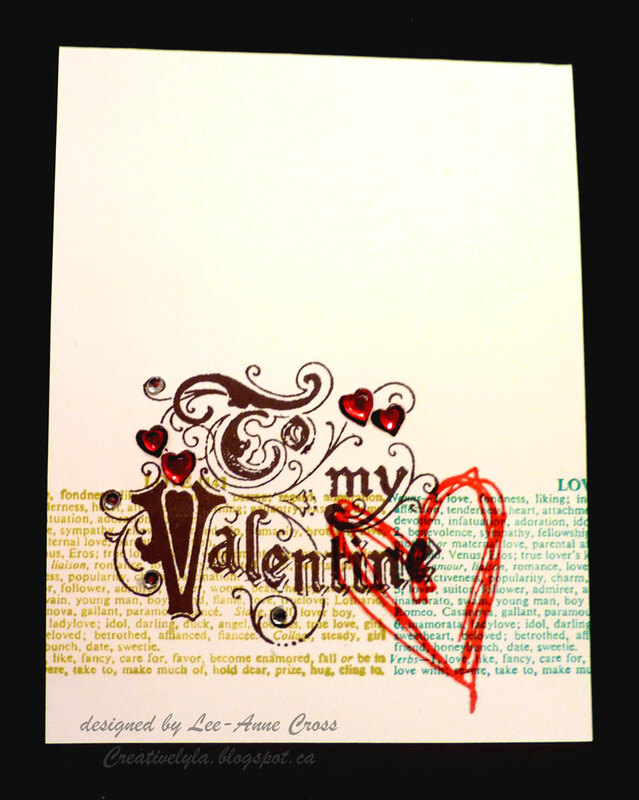 Then changing to the Bermuda Bay ink, using my Stamp-A-Ma-Jig I stamped it again the rest of the way across the card. Next, I used SU! Chocolate Chip to stamp the sentiment and SU! Ruby Red to stamp the heart image. And although it’s not really easy to see, the large red heart has been heat embossed with clear embossing powder. Then for just a little bling…red rhinestone hearts and a few clear rhinestones in the flourishes. 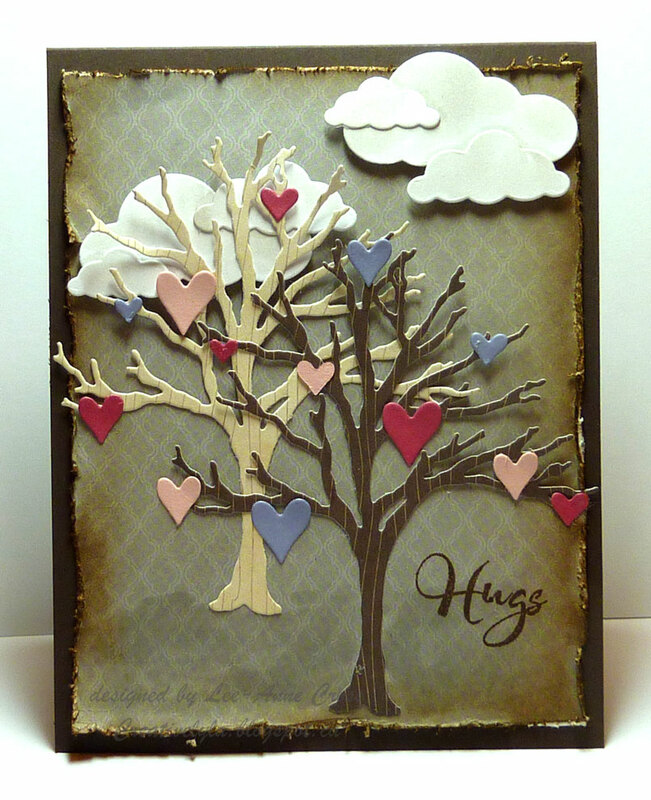 A very simple card…quick to make and fun colors! Thanks for hanging out with me today…see you soon!